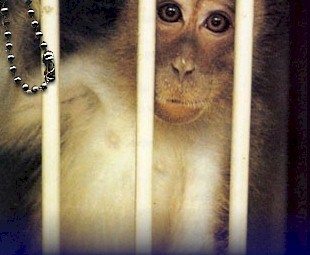 These are life stories of primates held in U.S. primate laboratories. They are based on documents obtained from the labs. Response from Jordana Lenon, public relations manager for WNPRC. Citizens' requests Lenon refused to answer. Curing vision problems in children? 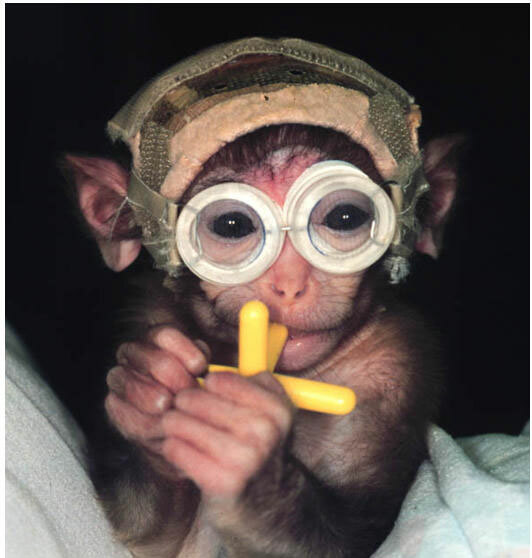 The infant pictured here was one of eight macaques used for durations of 3 to 24 weeks and was fitted with the goggles shown on the first day of their lives to decorrelate their vision under the claim of studying infantile esotropia. Like so many similar experiments in the past, the macaques developed the desired vision problems. 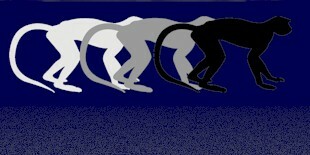 The macaques left Yerkes Primate Center at Emory University and were shipped to Washington Univ. in St. Louis, MO. between 4 to 6 months of age and were trained to perform tasks and were rewarded with food. Eye coils were implanted at one year of age and all the macaques were teted for 3 to 6 months. These visually impared infants were required to maintain their eye position within a certain range for up to five seconds to receive a juice reward. 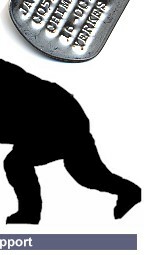 "...The monkey sat in a primate chair in the middle of field coils. The head restraint was locked to preclude head movement and the room was lit with dim background illumination. Eye position was calibrated at the start of each recording session by using a calibration coil and by having the animal maintain eye position within a 2 degree window of target position." "The animals were anesthetized deeply and a lethal dose of pentobarbital was administered, followed by perfusion of fixative through the left ventricle using an electric pump. The cerebral hemispheres and brain stem were then removed from the cranium and immersed in a separate container of fixative. The visual cortex was unfolded and flattened, then cut in to 40-um sections on a freezing microtome in a plane parallel to the pial surface." This horrific waste of time, money and primate lives was funded by your tax dollars from the National Institutes of Health grant # 5R01 EY010214 08-11 and the National Eye Institute. Additional funding was received from the Walt and Lilly Disney Scholars Award. This information is taken directly from an article published in The American Ophthalmological Society, titled, Causing and Curing Infantile Esotropia in Primates: The Role of Decorrelated Binocular Input (An American Ophthalmological Society Thesis), Trans Am Ophthalmol Soc. 2007 December; 105: 564-593 by Lawrence Tychsen, MD. The National Eye Institute, with the help of the National Institutes of Health, has funded approximately 52 similar grants for a total of almost $100 milllion dollars. NIH data tells us researcher Lawrence Tychsen was awarded $2.8 MILLION dollars to perform this cruel experiment. He stole any happiness the primates might have enjoyed in their all too short lives. These facilities are nothing more than a death-trap for animals and are not producing the cures and treatments American taxpayers have funded and been promised for decades. Researchers continue to ride the federal gravy train and receive grants but produce no new information. Experiments similar to the one describe here have been performed many times and until we complain LOUDLY to our elected officials, this waste, pain and suffering will never end. We hope you will consider contacting Sen. Christopher Dodd of the Committee on Health, Education, Labor and Pensions and let him know how you feel about this and the many other experiments just like it. These eight primates are dead but their siblings remain in the laboratories. Please speak for them. 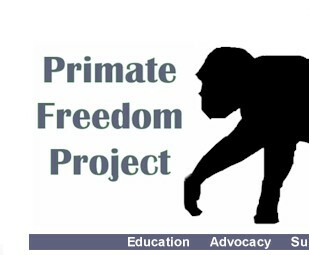 Copyright © 2005 Primate Freedom Project. Web Design by Griffin Web Design.